If you are recovering from an injury, or caring for a hurt member of your family, you may understandably want to avoid the hassle of filing a personal injury suit. The process can take time, and there are many complex legal questions that need to be addressed. These are valid concerns. However, if your life has been affected by a negligent party, you should consider the ways that a personal injury lawsuit can reduce your overall stress in the long run. This is especially true if you have a qualified New York City personal injury law firm like The Orlow Firm, working for you. Medical bills can pile up quickly after a major accident. You or your relative may need emergency treatment, surgical or pharmaceutical remedies, physical therapy, psychological counseling, and more. At the same time, you may be missing work or going without a family member’s income. This is naturally a highly stressful position to be in. If you successfully file a claim against the party who caused your injuries, you can be awarded compensation for all of these expenses. You may also be able to win damages for pain and suffering, attorney’s fees, and more. This compensation can certainly help ease your concerns about your financial future. The difficulty of filing a claim can be greatly reduced by having an experienced New York City personal injury attorney on your side. You can let your attorney worry about matters like gathering paperwork, contacting expert witnesses, and possibly reaching a fair settlement without a trial. Holding reckless parties responsible for the damage they do sends a clear message to the community. If individuals or companies do not take fair safety precautions, they will face consequences. Bringing negligent behavior to the public’s attention can help people who would otherwise become victims in the future. It is normal to feel anxious about placing an elderly loved one in the care of a nursing home. No matter how thoroughly you check a home’s credentials, something can always go wrong. 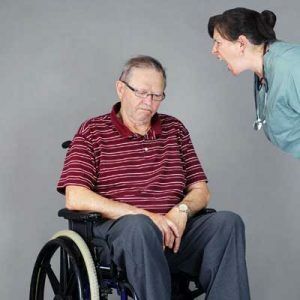 Many people with loved ones who are in residential care want to know about nursing home abuse warning signs they should look out for while visiting. Of course, these signs or lack thereof cannot definitely tell you if a senior citizen is being mistreated. If you have any doubts, contact your local police department, or call Protective Services for Adults at 1-800-342-3009. If an investigation has shown that your loved one did experience nursing home abuse or neglect, you may be wondering what the next step is. Even if the people responsible are convicted in a criminal court, this may not help you or your family with the practical matters you now face. For example, can you afford to place your elderly relative in a better home? Filing a civil claim against your loved one’s abusers may help you win compensation that can make this difficult time a little easier on your family. You could be able to win damages for pain and suffering, medical expenses, and lost wages if you missed work to care for your relative. Contact our New York City nursing home abuse lawyers today to find out more. The Orlow Firm are experienced in handling cases of all types of nursing home abuse throughout NYC. Contact us today for a free consultation. Burns are tissue injuries, and they occur when the body is exposed to large amounts of heat. Bodily tissues, including skin, fat, muscles, and even organs can be damaged when they come into contact with powerful heat sources. Burns are classified according to the extent of the damage done. Typically, first degree burns are those that only harm the outer skin layer, second degree burns are those that damage the first two skin layers, and third degree burns are those that injure all skin layers as well as any tissues underneath. Each type of burn is treated differently. Typically, third degree burns will necessitate professional medical attention, while first and second degree burns may be treated at home. While second degree burns (characterized by swelling, redness and blistering) can be treated as minor injuries, if they cover a relatively large area, they should be treated as major burns. Medical assistance may be necessary. If you have suffered a burn injury as the result of someone else’s negligent actions, then you may have the right to recover damages. Contact the New York City personal injury lawyers of The Orlow Firm. Property owners and managers often have many responsibilities ranging from paying bills, dealing with tenants or customers, managing the business, and many other requirements that may take significant amounts of time and energy. In addition to the everyday responsibilities that the managers and owners may face, it is essential that they keep the safety of tenants, visitors, and patrons in mind. If a property owner fails to provide a safe environment on his or her property and an injury accident occurs, he or she may be held liable for the damages caused by the accident. Personal injury lawsuits often depend on proving that the property owner was negligent or careless with the maintenance, cleaning, or set-up of the property and the accident occurred because of his or her actions. Orlow, Orlow & Orlow, P.C. are happy to provide you with the following information on premises liability and how a New York City personal injury attorney can help you if you are injured on someone else’s property. If a property manager fails to observe a potential danger or if he or she is warned of a hazard and fails to correct the issue, the injured party may be able to pursue legal action. A New York City personal injury attorney can help you decide what action you may take following an injury accident. If a person suffers serious injury in an accident, he or she may choose to pursue a personal injury claim against the property owner. Personal injury and premises liability claims often rely on proving that the owner had a duty to protect the people visiting his or her property and failed to live up to the expectations of the law. Furthermore, it is essential to prove that the accident was caused by the hazardous conditions on the property, and that the person’s injury was a result of the accident. These elements are all considered essential for a personal injury case and are referred to in legal terms as a “tort”. A New York City personal injury attorney of Orlow, Orlow & Orlow, P.C may be able to prove your personal injury case by utilizing the elements of tort litigation to prove duty, breach of duty, accident, and injury. If all of the essential elements are present, the injured party may be able to prove his or her case in court. Persons who have been injured in an accident may seek compensation for pain, suffering, mental and emotional trauma, and medical expenses incurred because of the accident. Personal injury accidents sometimes carry a negative connotation, especially because some may be filed for frivolous reasons. Serious injuries may carry severe consequences and may be very costly for the person who was hurt. In such cases, personal injury lawsuits may be necessary to recoup expenses and gain much-deserved compensation. If you have questions about personal injury claims, a New York City personal injury attorney of The Orlow Firm can help explain your legal options. When you suffer a personal injury that results in expensive medical bills, lost wages, and significant pain, you may be entitled to receive damages. Damages is a term used to describe the monetary compensation awarded to a plaintiff after making a successful personal injury claim. If you have been injured in a car accident, by assault, or as any other result of someone else’s negligence, then you may be able to recover damages with the help of an experienced personal injury lawyer. There are two main types of damages: compensatory and punitive damages. Both types are paid by the defendant to the claimant. Compensatory, or actual, damages are used to reimburse or make up for the injured party’s losses. Under tort law, medical bills, lost wages, pain and suffering, and damaged or lost property are all covered by compensatory damages. Punitive damages serve the sole purpose of reprimanding and reforming the defendant. They are awarded to the plaintiff in an effort to deter the offender from taking the same course of action in the future. Typically, punitive damages are awarded when the action taken was especially destructive or harmful. If you have suffered a personal injury and would like to learn more about the different types of damages you may be able to claim, then the New York City personal injury lawyers of The Orlow Firm can help. Contact us today to speak with an experienced attorney about your case. Some businesses try to save themselves from liability by forcing their clients to sign waivers of liability. This typically applies to companies involved in fields which are potentially risky or dangerous. This can include obviously risky things such as skydiving and snow skiing and also more mundane things like bicycle and skate rentals. Sometimes, especially with dangerous activities such as bungee jumping, it can be said that the participants are choosing to take part in the risky action knowing the dangers involved. Thus, they have voluntarily waived the liability to the company and have agreed not to seek damages for potential injuries. Usually, playing a sport or any other athletic activity prompts a business to have a waiver. However, some sporting events attended by thousands of people are understood to have an inherent amount of risk that the attendee should expect without signing a waiver. This is sometimes called the “assumption of risk.” Places where assumption of risk might come into play include attending baseball games and golf tournaments. Although designed to protect businesses, waivers of liability cannot always be enforced. If the waiver does not fully explain the risk involved in the activity or is not worded properly according to the law, it can be considered an unenforceable waiver of liability. Also, in cases of gross negligence committed by the business, waivers might not always protect them from a person seeking damages. If you have suffered a personal injury and have questions as to whether you signed an enforceable waiver of liability or not, contact New York City personal injury lawyers of The Orlow Firm.